While visiting Tokyo this past June, I met with historian, writer and publisher Ivan Vartanian of Goliga to discuss several of his current projects, which explore the intersection of bookmaking, performance and the photobook. Russet Lederman: For the past 15 years, you’ve been writing, editing and producing books on Japanese photographers and the Japanese photobook. Japanese Photobooks of the 1960s and ‘70s (2009), which you co-authored with Japanese curator and scholar Ryuichi Kaneko, has been a very important reference and guide for introducing western audiences to the various elements of the Japanese photobook and its distinct role as the primary format for the presentation of photography in Japan. More recently, you’ve organized several projects that explore the intersection of performance, bookmaking and the photobook. How do you see the relationship of performance to the larger historical context of Japanese photobooks? Ivan Vartanian: When I was researching Japanese Photobooks of the 1960s and ‘70s, I realized that I was drawn to this period because it represented a real coming together of many different aspects of visual arts, culture, photography and political activism in Japan. The function of photography took on a whole different role in the 1960s, transforming from something in newspapers to something that students could use to document their immediate experience. Reportage in and of itself shifted from ordained photojournalists to ordinary people who could have a camera, and maybe were using the wrong speed film and over-exposing their photographs. They were using really cheap equipment and it had an authenticity and immediacy that was groundbreaking. Fine art photographers like Daido Moriyama and Araki responded to this very primal, urgent wave of photography by questioning publications: not just photobooks, but also magazines. The idea of being in print was something that a lot of photographers played with and manipulated as a vehicle for experimentation beyond established forms. At the time there was a big overlap between theater, literature, film, music and more traditional arts. Many ideas about performance, drama, staging and mis en scene were heavily influenced by Shuji Terayama, who was not just a playwright but also a poet, filmmaker, writer and photographer. He was a risk-taker, who would have these spontaneous performances where he’d break into someone’s apartment. Moriyama, as Shuji Terayama’s photographer, was greatly influenced by him and also by what was happening in New York at that time, so it wasn’t a big leap for him to do something like Printing Show, his original 1974 performance bookmaking event in Tokyo. RL: What sparked the idea for the recreation of Moriyama’s Printing Show in New York as Printing Show – TKY at Aperture this past November? RL: What I found interesting during Moriyama’s Printing Show – TKY book performance, where each visitor created a book through a process of selecting and sequencing 20 photocopied Moriyama sheets into a staple-bound book with a silkscreened cover, was that the end result had a large element of surprise and randomness. In the assembled book, each of the 20 sheets was folded in half to create gatefolds. This made it nearly impossible to know exactly what the final book would look like. Can you discuss the nature of this balance between planning and surprise? IV: A lot of people who came to Printing Show – TKY had never sequenced a book before in their lives, and a lot of those people were photography professionals. Moriyama, who has a long history with bookmaking, was interested in letting go of the editorial process in Printing Show – TKY. This is what he did with his Shashin yo Sayonara / Bye Bye Photography (1972), where he chose to leave the edit and sequence entirely up to the book’s editors—a conceptual leap from being a photographer to being an artist. In the original 1974 staging of Printing Show, Moriyama generated the composed pages by photocopying multiple prints together at the same time. He then shuffled the resulting Xerox sheets to assemble each copy of Another Country in New York (1974), the first photobook created through Printing Show. In one of our planning sessions for TKY, after a couple of hours of poring over prints spread across two large tables, Moriyama stood back, leaned against the wall and, in his signature way, said, “How about leaving the edit to the participants?” The idea was like an explosion in the room and the entire project jumped to an entirely different level. Initially he was concerned that there would be too many pictures to choose from during Printing Show-TKY and this might frustrate people. I wanted to maintain that inability to find resolution in the selection process. That was why during the planning stages I made a dummy that had one gatefold. I love gatefolds and suggested to Moriyama that we make every page in the book a gatefold, to which he agreed. The idea was to completely eliminate all theme, narrative and concept, and to deal with images in terms of surfaces and textures—to make people as aware as possible that they were looking at a facsimile, a reproduction that was also an original image in itself. That was why I had the photocopy machines and the silkscreen stations in the gallery. The entire project was about this constant flickering between an image coming together as an image and also just being grain on a page, an abstraction. Similar to the Xerox recompositions he did for the original Printing Show and that project’s balance between image and abstraction, Moriyama will generate contact sheets by mixing together his negatives in an upcoming Aperture book that I am helping to make, entitled Labyrinth (October 2012). All these processes resonate on multiple levels across different, yet simultaneously occurring projects. This is what is fascinating about Moriyama—he is always processing and rethinking his photography on countless levels and formats at the same time. RL: In conjunction with Moriyama winning the ICP Infinity Award for Lifetime Achievement in May 2012, you organized two associated events. One was a Moriyama pop-up library of all his books at the ICP Library and the other was the creation of a special edition of his most recent photobook, Color. Again, performance played a central role in the production of this special edition. How and why were performance and audience participation included? IV: After Printing Show – TKY, I realized that when the photographer is present and doing something, anything, whatever space you’re in changes into a theater or stage. When the artist is in the room, it is a magnetic and completely different experience from an exhibition or regular book signing. This absolutely fascinates me and relates to my larger involvement with photographers. When I spend time with Rinko Kawauchi, Takashi Homma, Moriyama, and Hosoe, there’s something special about them – I’m either on edge or nervous, but always excited to be in their presence. It’s like the air is thick with potential. In the case of Color, just adding the simple action of having Moriyama sign the cover of the book and having the bookmaking process completed in front of the participant meant that even for a short time there was this meeting, a connection between the participant and photographer. And that is ultimately what makes these performances so interesting. The participant can step into the photographer’s world and be connected to that body of work in a way that isn’t possible otherwise. I want to get away from that white cube with framed prints on a wall that no one can touch. What is ultimately interesting to me about photography is that it’s about a connection and an opening to interpretation — there is an element of not being sure what’s going to happen. RL: Shortly after the very successful Moriyama Color / ICP book signing, you organized a Takashi Homma performance in Tokyo at LimArt. Similar to Moriyama’s Printing Show – TKY, visitors were asked to buy tickets for a specific time slot and were active participants in the production of the resulting prints. Can you tell us about this event? IV: With Homma’s Rrreecconnstruccttt performance, it was free to enter but to participate and receive a print, a ticket needed to be purchased. The participants, I call them participants, could buy a one or two-print course. Once the participants made their course selection, then they were given a ticket, which was brought to Homma. An attendant retrieved their selected prints and gave them to Homma, who then asked them whether they wanted their prints cut up a lot or a little. Based on their response, he cut up the prints and returned a pile of chips to the participant, who was asked to recompose the photographic chips in a completely new configuration. When Homma and I first discussed this project, the idea was that he would cut the prints with 1, 2, 3 or 4 simple cuts. On the day of the event it all jumped in terms of complexity. Photographs were cut in every imaginable way: vertically, horizontally, diagonally, small, big or in squares. It all depended on what the person wanted. In some cases, where the participants opted for the two-print course and chose two copies of the same image, that same image was interspliced with itself to render one complex photograph. All participants went home with their cut-up, recomposed and mounted print signed and stamped by Homma. We photographed every single recomposed photograph. I wanted the event to be as analogue as possible. I actually had a bunch of tape recorders in the room as well. I was thinking along the lines of John Cage — cutting up the audiotape and splicing it back together. RL: How many prints were done from the performance? IV: It was 2 full days and there were 20 prints, two from each series. There were 110 participants who attended the event. Most people did a two-print course, so there were about 200 images created. We will select about 40 recomposed prints along with some later reconstructions in a reasonably priced limited edition book due out this fall. I’m going to interchange the folios of the book and have them stitched randomly so that in some copies the first page will be in the middle and in others it will be at the end. Again, I’m playing with this idea of breaking up the sequence and questioning the composition of front to back narratives – making the reader look closely. The slipcase for the book will probably have slits, so the image will change on the front cover as the book is slipped out. It is still a bit in flux. I never know what we’re going to do until we actually do it. RL: Another event you recently organized was an Osamu Kanemura book performance entitled Human Noise Amplifier at BLD Gallery in Tokyo. Visitors were again active participants in the book creation process, this time as “noise amplifiers.” How did the idea for this performance evolve? IV: I start with general parameters, but there is always an element of surprise. I have to completely trust that it will all work out. In the case of Human Noise Amplifier, Osamu Kanemura had never touched a digital camera before; he had never shot Polaroid before; and he’d never done a performance before. Kanemura is a cool cat. He wears dark sunglasses and is shy. He was completely out of his comfort zone and just went with it. We went through 4 or 5 ideas in discussing this project. Most of the time, Kanemura goes out of his way to avoid people in his photographs, and I thought it would be really interesting to flip that around and purposefully insert people. The analogue elements in the performance grew out of my resistance to what is happening with a lot of online photography. Despite sites like Flickr and Instagram being really wonderful contributions to the conversation about photography, I am still drawn to the here and now that’s about materiality and the artist’s presence. 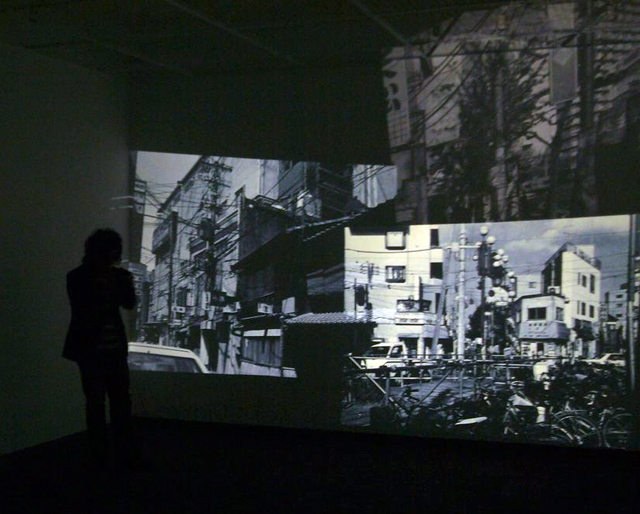 With Kanemura, I intentionally used old carousel slide projectors loaded with earlier images of his because I wanted the sound of the advancing slides, the possibility of jamming, and the annoyance of reversed and flipped slides – all of which did happen during the performance. I remember seeing the video documentation of a Diane Arbus talk from the 1970s where Arbus is heard commenting about the projections, “Oh my god, this slide is out of focus. Can we get it focused?” As her photograph moved in and out of focus, it became a different photograph. We wanted those same kinds of accidents to happen in Human Noise Amplifier. I literally put the slides in the carousels so quickly that some of them were backwards. It wasn’t specifically intended, but it turned out to be an accident that we wanted. We did a preview on Friday when I gave Kanemura the digital camera and 2 SD cards for the first time. The idea was that he would shoot participants in the darkened room with the slide projections until a card was full and then we’d trade off. He got so completely excited and animated upon seeing people interact with his work that he shot far more images than we originally discussed. He gave me one card and I put it into the computer and was in the middle of downloading the information when he came back with another full SD card. After each 30-minute session, I rushed to lay out the thumbnails of Kanemura’s images from the SD card in a gridded chronological order on the pages, which were then printed with a commercial desktop laser printer. To complete the book’s cover, Kanemura took a Polaroid of each participant in the darkened projection space. The Polaroid was adhered to a stenciled cardboard cover selected by the participant and the gridded pages and cover were staple-bound before being delivered to the participant. RL: What other recent book performance projects have you done? IV: The most recent performance is called Approaching Whiteness by Rinko Kawauchi. Rinko is very much about dealing with time in a very particular way. When I invited her to do this project, she indicated that she wasn’t really comfortable with other people editing her work. She showed me a prototype of the first self-published book she ever made, which was an accordion style on Japanese paper in an edition of three. Logistically, it would have been a complete nightmare to do an accordion binding during a performance and ultimately we realized that a scroll would be more appropriate conceptually for this project. Rinko is known for doing these really sensitive edits and mixing different things. The new work presents nine different sequences, including a solar eclipse; a deer that’s been hit by a car; a lotus leaf shot from different angles; school children climbing up stairs; and a flickering candle flame. As the reader scrolls through each sequence—from right to left—of evenly spaced and sized images, the overall impression is of an uninterrupted flow of time that is particular to a scroll. There are no pages to turn and no interruptions, but somehow time advances. Fascinating! The participant selects a scroll from among the nine sequences available. The verso of the scroll is silkscreened during the performance in a traditional Japanese pattern of the participant’s choice. 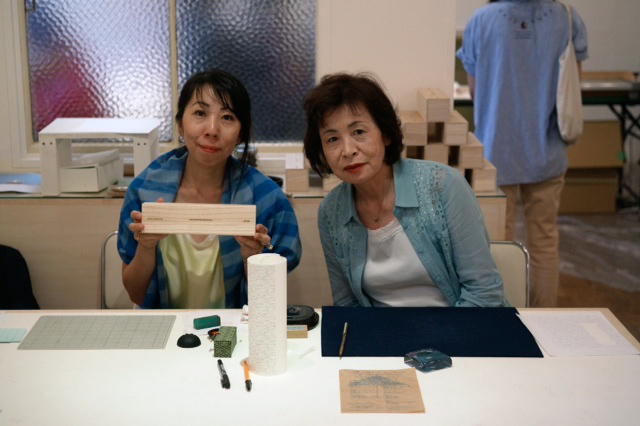 Once it is dry, the scroll is laid in front of Kawauchi’s mother to write the title with a brush—she has been a practicing calligrapher for over twenty years—then passed to Rinko to put her stamp on it. The finished scroll is rolled up into a custom-make Paulownia box with the title, publisher’s logo and Kawauchi’s name laser cut into the surface. The box is then presented by the artist to the participant as a closing gesture to a highly ceremonial process. The entire idea is reflected in the title, Approaching Whiteness / Yooyoo Shiroku, a quote from the first sentence of Sei Shonagon’s Pillow Book from the late 10th / early 11th century. The sun is coming up over the mountains, making the purple-hued mountains in the distance appear whiter and whiter. The day thus begins, as does the narrative itself. At Rinko’s prompting, I re-translated the Japanese even though it is slightly different in meaning from the Japanese title. I translated it as ­Approaching Whiteness, which can either be interpreted as The Approaching Whiteness or I am Approaching Whiteness. It captures the essence of the performance and resulting scroll, which is about being very quiet, slowing down, and going back to your ancestors — going back to what is the essence of Rinko Kawauchi. It is so typical of Rinko to choose the smallest things to contain the largest of meanings. RL: How do you see your role as a publisher in light of your recent photobook production as “performance” events? IV: I think the question of what is a publisher is very interesting. Usually, it’s about taking a body of work and putting it into a traditional book format for distribution. That is completely uninteresting to me. I’m looking for that place where we can take the publishing process and make it as much as possible a clear reflection of the photographer’s empirical involvement with the book/object/thing/experience/dynamic/installation/moment as a work in itself—while simultaneously incorporating a distribution and sales model. I also want to bring people together and have them actively engage with the work. I see the performance venue as a theater, library, thinking space, communal area, and the provenance of the artist. That’s what these performances are about — being connected, being present. That is also what I am responding to. I’ve spent years sitting in front of a computer doing book packaging, sending emails – I don’t even use the phone anymore. Now, what is most interesting to me is engaging with and talking to people while working together. I see books as part archive, part documentation and part meta-process. The book itself has to be an outcome of the event process that it is documenting, but it is also this reflection of whatever it is that we are making at that time. And that, I think, is ultimately what I’ve learned from Japanese photobooks. It is not a reproduction of something that happens somewhere at some point. The photobook in its reproduction and in its creation is an original. Even though there are 3,000 of them, each one is an original and is a reflection of the photography that it contains. Everything that I’m doing now comes back to that one idea. Recent acquisition – catalog number not yet assigned. This entry was posted in artists' books, Events, International, Interviews, Seen and heard, Visual Research and tagged Aperture Gallery, BLD Gallery, bookmaking, Daido Moriyama, Ivan Vartanian, Japanese Photobooks, Japanese Photographers, Osamu Kanemura, performance, Rinko Kawauchi, Russet Lederman, Takashi Homma. Bookmark the permalink.